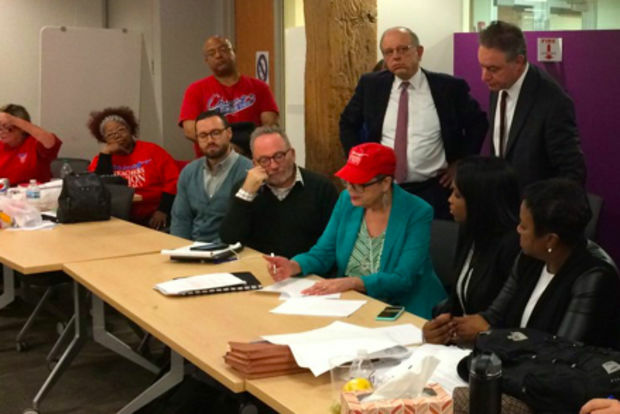 CHICAGO — A last-minute deal late Monday averted the second Chicago teachers strike in four years, as Chicago Public Schools officials and leaders of the Chicago Teachers Union reached a tentative agreement on a new contract minutes before a midnight deadline. 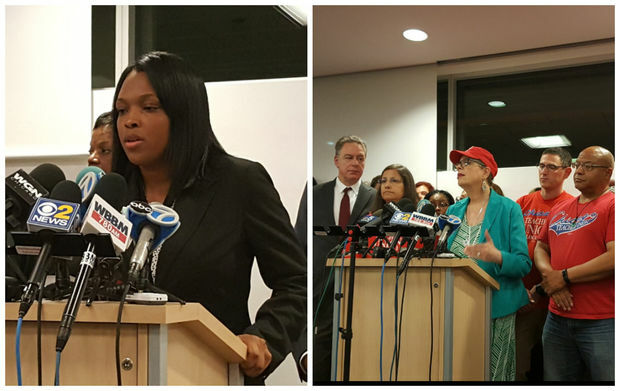 The compromise means school remains in session Tuesday for nearly 380,000 CPS students. "We are here to announce that Chicago Public Schools and the Chicago Teachers Union have a tentative agreement," said union President Karen Lewis. "There will be classes in the morning." Heather Cherone talks about the details of the agreement. Chicago Public Schools CEO Forrest Claypool was jubilant at an early morning news conference at City Hall with Mayor Rahm Emanuel. "We are open for business tomorrow," Claypool said. Emanuel said the agreement ensured that "teachers' hard work would be respected in this contract and appropriately rewarded." In addition, the deal will put the school district's finances "on firmer ground," Emanuel said. "We all came together to work together for a stronger future," Emanuel said, adding that he spoke with Lewis earlier Monday and "complimented" her on her hard work in reaching the agreement that was "fair to all parties." The four-year tentative deal — retroactive to the 2015-16 school year when teachers worked without a contract — phases out the "pension pickup," for newly hired teachers. New hires will be required to contribute 9.4 percent of their salaries to their retirement account. In return, teachers hired after Jan. 1 will get two raises of 3.5 percent — one effective in January and the other effective in July. "This is not a perfect agreement," Lewis said. "But it is good for the kids. And good for the clinicians. And good for the teachers, and the paraprofessionals." CPS will continue to pay about 7 percent toward the pensions of existing employees, who will continue contributing 2 percent to their own retirement accounts, Lewis said. The deal includes 2 percent cost of living raises for employees in the third and 2.5 percent in the fourth year of the deal. It also offers "steps and lanes," automatic bumps in teacher pay that kick in with seniority and experience. The tentative agreement must be ratified by the union's House of Delegates before it can be implemented. That session has not been set, Lewis said. In addition, the deal requires teachers to pay 0.8 percent more for their health insurance. CPS officials also agreed to earmark $7 million to hire teachers assistants in kindergarten through second grade classes with more than 32 students, starting in January. In addition, 1,500 teachers will get an incentive to retire early at the end of this school year — an extra $1,500 per year of service to the district. Members of the support staff with 10 years of service will get an extra $750 per year of service if they retire at the end of the year. The deal also includes a pledge to rehire tenured teachers whose positions are eliminated; requires CPS to consult with the union before privatizing any more nurses positions; and establishes more preparation time for teachers during the school day. City officials presented a new offer to union negotiators around 8 p.m. Monday, just four hours before the midnight deadline. During a 10 p.m. news conference, Lewis said she and other union negotiators were going through the new offer "line by line" before deciding whether to accept it, as exhausted parents waited up to see whether their children would go to school Tuesday. The deal offered by CPS negotiators late Monday was "significantly better" than what it offered teachers in January, Lewis said, only to see it rejected by the union's leaders. Mayoral spokesman Adam Collins told WBEZ that the deal was being financed using part of a $175 million surplus from the city's tax increment financing district funds, with $88 million going to CPS. The union had said earlier Monday that it was holding out for a $500 increase in funding per student. Teachers picked up red shirts and picket line signs throughout the day Monday and said they were "fired up" and ready to fight. The tentative agreement means plans for teachers to picket schools starting at 6 a.m. were canceled, and classes were set to resume as normal after the Columbus Day weekend. In 2012, teachers walked the picket line for seven days before coming to an agreement that included a double-digit salary hike during the term of the three-year deal, including raises for cost of living. Other increases for experience and advanced education were maintained. The union also beat back Emanuel's push to tie teachers' compensation to a toughened evaluation system and ensured teachers with tenure would have an advantage at finding a new job if their school was closed. Emanuel won his bid to institute a longer school day and school year while changing the teacher evaluation system to consider student performance. Teachers walked off the job for 19 days in October 1987. Before that, there had been nine strikes between 1969 and 1987.